Tropical Almond Coconut Mango Smoothie is a healthy protein packed smoothie to add to your rotation mixing almond coconut milk, frozen tropical fruit and chia seeds. My newborn isn’t so much of a newborn anymore! He is 6 months old and has developed a little personality. He is the happiest baby and loves to “talk” and watch his big brother Will while laughing at the silly things he does. As he gets older I keep thinking my energy level will come back but it hasn’t. It isn’t because of a lack of sleep because he is finally sleeping through the night (happy dance!). It more has to do with me trying to keep up with an energetic 3 year old, a 6 month old and all of the other things that goes into our daily lives. Now with that in mind being busy and tired is no excuse for making bad decisions and cutting the healthy stuff out of our life. I still strive to eat and cook with healthy ingredients and incorporate certain foods into our daily life. Almond milk is one of those things that I have started using, especially in smoothies, like this Tropical Almond Coconut Mango Smoothie. Why almond milk? A few reasons I like almond milk is that it does not have saturated fat, is low in calories (for those watching their calories), provides 25% of your Vitamin D and 20% of your daily calcium. I also like the slightly sweet taste it adds to smoothies, cereal and oatmeal. 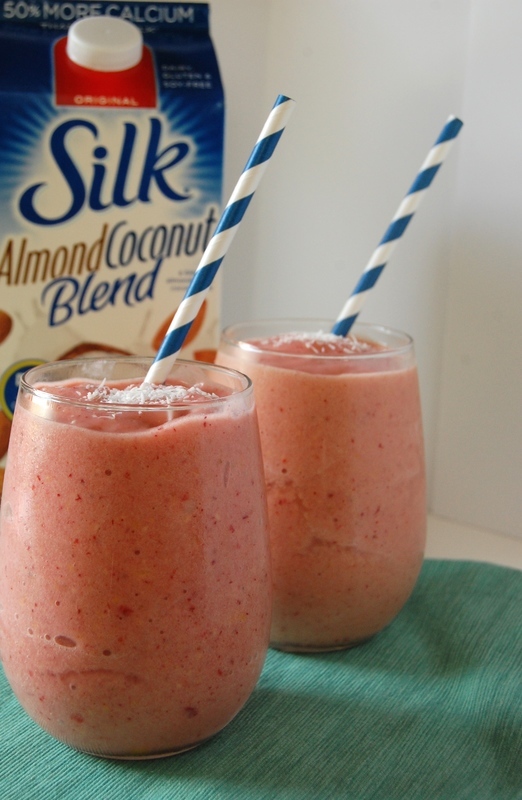 Silk makes almond milk and recently came out with two new blends including the Silk Almond Coconut Blend. I knew when I saw that blend that it had to go in my smoothies. 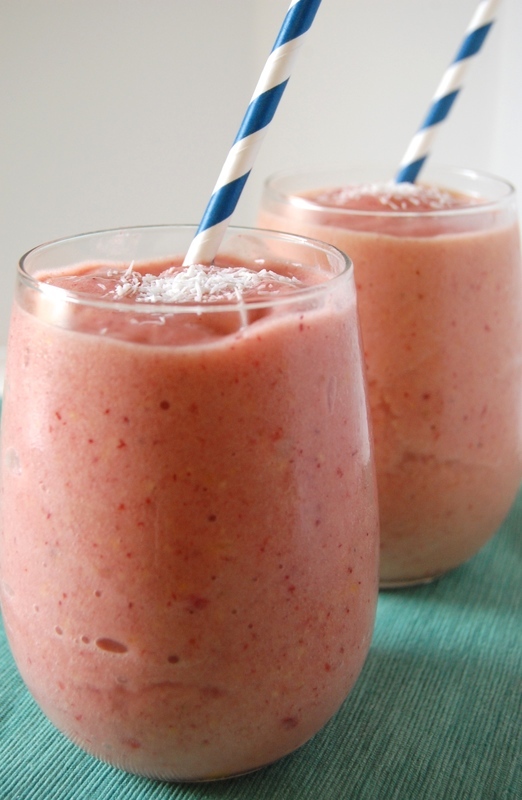 I really like adding coconut flavors to smoothies, especially in the warmer months. They remind me of sipping drinks in tropical places. A girl can dream, right? This smoothie has all of your favorite tropical flavors including pineapple, mango, banana and strawberries along with the almond coconut milk. In previous smoothie recipes that I have shared I mentioned that I am not the only one that loves smoothies in my house. When I make them Will always comes running over and wants a glass of his own. The nice thing about blending a smoothie together is that it is a great way to sneak in healthy things like chai seeds, almond milk, spinach and fruit. As you can see Will enjoyed this smoothie and couldn’t even wait for me to switch it from a glass to a kids cup. Tropical Almond Coconut Mango Banana Smoothie Prep time: 5 minutes Serves: 1 Ingredients: 1/2 cup Silk Almond Coconut Blend 1 frozen banana 1/2 cup frozen pineapple 1/2 cup frozen mango 1/2 cup frozen strawberries 1/2 teaspoon vanilla extract 1 teaspoon chia seeds (optional) Directions: Put all ingredients in a blender and blend until smooth. Check out the Silk New Almond Blends and get a coupon on their Facebook page. This is a sponsored conversation written by me on behalf of Silk. The opinions and text are all 100% mine and I only share products and brands I believe in and use. Julia This is a sponsored conversation written by me on behalf of Silk. The opinions and text are all mine.